Well, I don't know about you but I love short cuts. I love recipes that you don't have to wait for or you can cheat on - especially desserts. Now I do have a donut recipe (will go on the blog eventually - I promise!) that uses yeast or SR flour for those on a time limit, but my lazy donuts are a whole new level of cheating; five ingredients and eating in ten. It's so quick and easy that I'm writing this right now at the airport, with no recipe in front of me ... got to love free wifi!! I guess if you got into the technical side of things, these donuts may be considered more of a fritter. However, we call them lazy donuts at our place! And I originally created them when I had a craving for donuts and didn't have much in the kitchen, as I was cleaning out the fridge ready for our holiday, other than pantry basics. They turned out great! 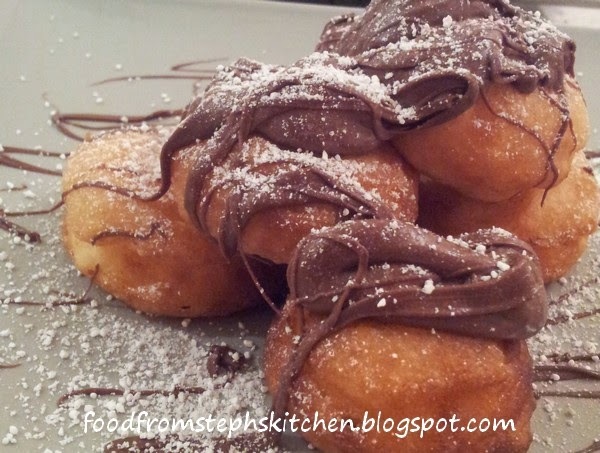 Makes 14 small "donuts" - enough for a quick dessert for two! Mix all dry ingredients in a small bowl. Add milk and mix to create a batter. Heat up some vegetable oil in a small pan over a medium to high, no more than a couple of centimetres deep. Once hot (you can feel the warmth when you hold your hand over the top of the pan), drop in tablespoons of the batter into the oil. When a couple of bubbles appear turn your lazy donuts over and cook the other side (cooking no longer than a minute). 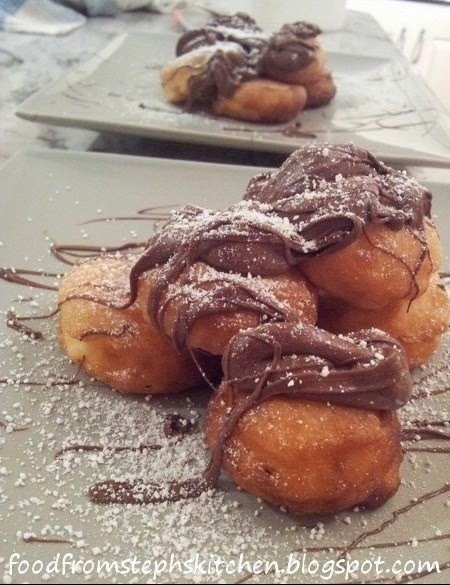 Place each of the donuts on some paper towel to drain the excess oil off then serve, drizzling some warmed Nutella over the top and a sprinkle of icing sugar over the top. And that's it. Told you it's easy!